Android Tv Box Not Working - Tips to Fix Your Tv Box! Get the Amazon Fire TV Canada Edition – Review + Buying Guide! Best Android Tv Remote Control App – Replace your IR Remote, Now! Android Tv Box Not Working – Tips to Fix Your Tv Box! Top Android Tv Box Questions! – Breaking Every Myths So Far! In this post, we try and solve the most asked question: “My Android Tv Box Not Working”. So finally you have made up your mind, and have selected the top android tv box. You have made a bold move to convert your traditional television into a smart TV. The box is completely productive and helps you to download, search the web, watch videos, play games, and view your social profiles, etc., all through your television, while you lay on your couch. But, not everyday would be a good day. On a bad hair day, your android tv box may give you issues, and you are bound to wonder “Why is my Android Tv Box Not Working?”. You might be pulling your wits in understanding what has gone wrong on to your favorite device. Another interesting problem may also lie in when you have given up your cable subscription for kodi or iptv box subscription. You would have a scenario that you may would have to skip your television session, but because your android tv box is ain’t working. Look no further, we have your back, and have come up with this interesting post, where we would deep dive and you overcome such scenario, in case your android tv device or apps fail to start or load. Most of the issues that offer for failed tv streaming device is the lack of internet connectivity. This cause your videos or internet to become very slow, while streaming takes a very long time to load on screen, causing frustration. The problem may arise due to various reasons, like there may be something that is blocking your wifi router, or your ethernet cable may become loose. It could also be that your internet connection from your source may have fluctuation in connection. To start with, first install a Speed Test Application and run the test. Ideally, in most case you should be running a speed of almost 2-10 Mbps download speed. In case, the download speed is low or if your apps streams on low speed, then you need to clear your cache. You can go ahead and flush your DNS cache from your android browser. You can go to your browser’s settings and clear the browsing data and cache. You can also go to your phone Settings > Apps > Browser (we, prefer chrome). Here, go under Storage and click Clear Cache. Click Settings option, and search for More Setting. Next, if the above steps don’t solve your problem, then your router may be at fault. You start by troubleshooting your router, by unplugging your wifi router from the main, for at least a minute. During this time, begin cleaning the ports of the router. You should also unplug the cable from your android tv box. After you have neatly cleaned the wire and the ports, you can then replug your router and to your kodi tv box. Check and see the wifi signal that your box receives. You can also check the same way for your ethernet connection. Ensure that your lan cable is pinned in completely to the router and to the tv box. Another reason if you using the wifi router, always ensure that your tv box device is within the range of your router. Check that there isn’t any door or wall, obstructing the signal source to the android box. With the above solution, even if the problem still persists, then the actual problem may lie with your internet service provider. Start by calling up your internet provider and enquire for any disruption of service in your area. They may note down your complaint and check up for any issue in the cable line. Keep following up with them to ensure that your conection is restored at the earliest. It may also happen that your router may be at fault. This scenario is the least to happen, since most modern day internet routers do not fail. Your internet provider can help you check the working of your wifi router or ethernet connection. You can then follow up with manufacturer to claim for warranty, if exists on your router. Most of the time the answer to the question “Why my Android Tv Box Not Working?” lies in the power supply connected to your tv box. In many cases, the android tv box just refuses to start or power on. There may be many cases through which you can power your tv box again. 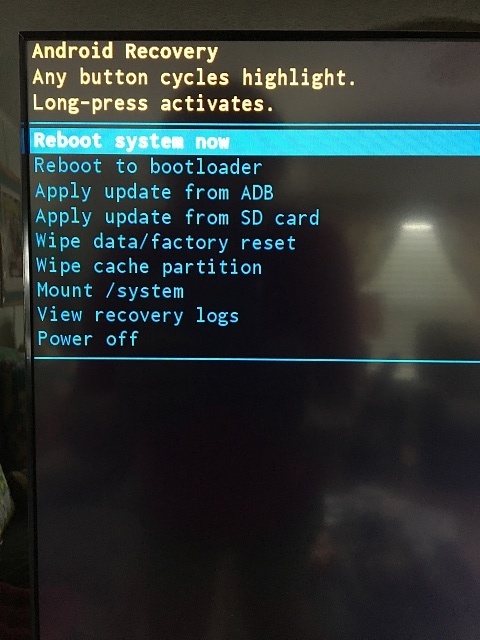 First, what you can do is to do a soft reset to your android tv box. Start by pressing the power button and hold the power button for 15 seconds. This refreshes your kodi streaming box, and your tv device should start automatically. If this doesn’t work, then start by unplugging the adaptor from the tv box and the main switch. Wipe clean the adaptor and keep it for a minute or two. After that, reconnect the power adaptor to the main outlet, check if the switch is properly connected to the plug. Then connect the adaptor to the tv box, and power on the switch. Also, check the power cord connected to your television. Perform the above steps for your television too. Even if the above remedy doesn’t work, then try using a spare power adaptor and perform the necessary connection again. This will help to check if your power adaptor is at fault or not. In certain case the “Stuck Buttons” issue may be a concern. Check your remote control to see if any button is stuck or check your power button to ensure that it is free and not stuck in the depressed position. This prevents your device from starting up. If this the case, use a small pin to remove the debris that prevent the button from popping out, and free your button from the current state. To solve the problem and to power your not working Android Tv Box to a working powerhouse, a Factory Reset is your only answer. Over time and use, our android box bloats with many unused files and memory, which prevents the device from running smoothly and becomes slow in executing most processes. A factory reset deletes all the files or unwanted cache from your device, and returns your android tv streaming box to its pristine factory original settings. Ensure to take a backup of all your files, since a factory reset formats your device. You may lose your movies, pictures, music, etc. The following steps should only be performed if you know what you are doing. In case your box is under warranty, kindly take your kodi box to your manufacturer. They should be able to fix your device, without any efforts. Before you start, first, disconnect the power cable from your tv box. Then, use a toothpick or a pin/screwdriver that is fine and thin. Insert the tooth pick into the SPDIF or the AV port. These ports are found at the back of your box. Once, you insert the pick, you should feel a small button. Gently press the button, until it is completely depressed. Keep this button pressed, now at this point, connect the power adaptor to your box, and power your tv device on. While you keep the button depressed, you should see the boot logo on startup. As soon as the logo disappears, release the button. Here, you may get two options. You may get the startup menu or you may see a screen asking you the way to boot your device. In either case, go to the bootloader menu, the onscreen navigation will help you get there. Next, in the bootloader menu, select the wipe data/factory reset option. At this stage, use a wireless keyboard or mouse. Next, select delete all the user data option. Sit back and relax, while your android box will do all the work. It will completely destroy all the unwanted data and return your device to its new state. After the data is erased, simply select the option to restart or reboot the tv device. In a few minutes, the tv box will return to its original factory state. You can then restore your application and files, from the backup you took initially. If none of the above steps work, then your best chance is to take your android tv box for repair to your manufacturer. In most case, an android tv box comes with 1 year of warranty, through which most of the problems can be solved during this period. You can also receive pro support from these folks, helping you clean all the problems in your box. In addition, you can also read your user manual. Most of the questions are answered through these manuals, where every issue/problem can be troubleshooted and solved easily. Conclusion – My Android Tv Box Not Working? Ahh! we so want that none of you should face this scenario. If ever, you reach this point, then our post on Tips to fix – My Android Tv Box Not Working? should help your resurrect your box tv to a new life. You can also read our post on 10 Tips – Android Tv Box | Increase KODI Performance by 70% for more such tips on the android box. Get cheap IPTV plans for Canada with over 500+ channels and plans starting at only CA $1.99.